The West Coast Regional office of the national marine sanctuaries manages 15,333 square miles of marine protected areas around Channel Islands, Cordell Bank, Greater Farallones, Monterey Bay and Olympic Coast. Each of our five west coast national marine sanctuaries is a jewel unto itself. Yet each of our sanctuaries is intimately connected not only with the others, but also to the entire coast from Alaska to Baja and to the far reaches of the world ocean via ocean currents. The links on this page will take you on a tour of the west coast sanctuaries where you will discover more exciting news about the work we do to keep our marine sanctuaries safe and thriving. A sanctuary advisory council is a community-based organization of representatives from various user groups, local businesses, government agencies and the public at large. Advisory councils provide advice to their respective sanctuary superintendents on management of that particular sanctuary. West Coast Region staff generated a report to highlight the major actions taken by each advisory council. This report was prompted by an advisory council member as a means to build networking opportunities between advisory councils. This document will also provide the public easy access to significant efforts taken by advisory councils. This document will be updated on a quarterly basis. The West Coast Regional Office operates two catamaran research vessels on behalf of the sanctuaries in central and northern California. The research vessels Fulmar and R4107 are homeported at the USCG's Breakwater Pier in Monterey where ONMS has support and maintenance base. 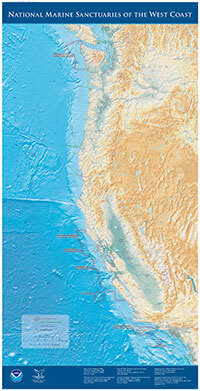 The 67' Fulmar in particular serves a very large operating area from Point Arena to Cambria. The smaller 41’ R4107 generally operates in a more limited range between Año Nuevo to Big Sur. For more information on these vessels, visit sanctuarysimon.org. Staff in the West Coast Regional Office has compiled relevant regulatory/management documents for all five west coast national marine sanctuaries into one comprehensive document. The purpose of this document is to assist staff and the public in easily finding information related to these five west coast national marine sanctuaries without having to visit multiple websites. This document will be updated as changes are made to site regulatory/management documents. Following are descriptions of the various components in this consolidated management document. contribute to attaining national system goals and objectives. Terms of designation are the official documents that designate a sanctuary and defines why the sanctuary was designated and summarizes how it is to be managed. Terms of designation also provide background information about NOAA's regulations within the sanctuary. At the beginning of the document, one will find a "Response to Comments" section that describes NOAA's responses to public comment on a suite of issues during the sanctuary's designation. ONMS regulations prohibit specific kinds of activities, describe and define the boundaries of the designated national marine sanctuaries, and set up a system of permits to allow the conduct of certain types of activities (that would otherwise not be allowed). In general, regulations are used by the ONMS to implement the National Marine Sanctuaries Act and national marine sanctuary management plans. Each sanctuary has it's own set of regulations, as well as regulations that apply to the entire ONMS system. The Federal Register informs citizens of their rights and obligations and provides access to a wide range of federal benefits and opportunities for funding. The Federal Register is printed each business day and contains information on federal agency regulations, proposed rules and public notices, executive orders, proclamations and other presidential documents. A list, with web links, of the important Federal Register notices for the five west coast national marine sanctuaries has been provided in the consolidated management document. In August 2011 the West Coast Regional Office published the National Marine Sanctuaries of the West Coast Ocean Acidification Action Plan. This plan was produced in response to the five west coast sanctuary advisory council resolutions calling for some form of action on the topic of ocean acidification. In September 2012, the Effective Practices for Communicating Ocean Acidification Workshop was held in Monterey, CA. The 90 participants, through panel discussions and break out groups, identified the most effective messages, tools and case studies to communicate the impacts of ocean acidification and foster positive public action. A workshop summary has been produced, which outlines the key messages, tools, and outcomes. The workshop led to the development of a National NOAA Ocean Acidification Education Implementation Plan that was in part modeled after the West Coast National Marine Sanctuaries Ocean Acidification Action Plan. The five national marine sanctuaries on the west coast are home to the largest concentrations of seabirds in the contiguous United States. Seabirds, including shorebirds, serve as indicators of ocean health within national marine sanctuaries. This is one of several reasons why national marine sanctuaries invest hundreds of thousands of dollars annually to better understand these creatures, protect them and educate the public about them. Recently, we developed a new brochure on seabirds to provide information on the importance of seabirds, research conducted on seabirds and how to reduce human disturbance to seabirds. In addition, Greater Farallones National Marine Sanctuary, in cooperation with Monterey Bay National Marine Sanctuary, have established the California Seabird Protection Network. The West Coast Field Guide introduces you to the natural and cultural wonders of your national marine sanctuaries. The California current, many marine species and historic ocean uses all connect these sanctuaries to each other, and to the human communities on the west coast. You can view an electronic version of the field guide online or have a free copy hard copy mailed to you by emailing nicole.capps@noaa.gov. To further tourism within the west coast national marine sanctuaries, a Travel Writer Brochure has been developed and is available for download only. The west coast sanctuaries are renowned for their abundance of wildlife and it is important we know how to properly interact with that wildlife. Please visit the Ocean Etiquette website for general marine wildlife viewing guidelines that help promote safe wildlife viewing. LiMPETS (Long-term Monitoring Program and Experiential Training for Students) is an environmental monitoring and education program for students, educators and volunteer groups throughout California. As part of this network, teachers and students collect rocky intertidal and sandy beach data. The ocean is vital to life and touches us every day. The ocean gives so much to California: food, water, commerce, recreation and the opportunity for quiet contemplation. Even medicines that heal us and the air we breathe come from the ocean. Yet, today the ocean is in trouble. Our ocean faces threats of pollution, marine debris, endangered populations, beach erosion and more. You can help. By learning about the ocean, getting involved in ocean activities and voicing your opinion to lawmakers, you can join the millions of Californians who are saying, "Thank You, Ocean!" Deep-sea habitats in the national marine sanctuaries off the West Coast are home to vibrant deep-sea coral and sponge communities. These deep-sea invertebrates provide refuge and food for many other species of invertebrates and fishes. Visit this Story Map to learn more about the locations and unique ecology of deep-sea corals. Explore techniques scientists at national marine sanctuaries use to study deep water habitats, and the threats these fragile animals face. Learn ways you can protect these extraordinary deep-sea communities. The National Marine Sanctuary Program Condition Reports provide a summary of resources in each sanctuary, pressures on those resources, the current condition and trends, and management responses to the pressures that threaten the integrity of the marine environment. Specifically, the reports include information on the status and trends of water quality, habitat, living resources and maritime archaeological resources and the human activities that affect them. The West Coast Observations network is comprised of 36 instrumented mooring arrays located at long term monitoring or sentinel sites within the five sanctuaries. The moorings collect information on ocean temperature at multiple depths. In certain locations, current speed and direction, oxygen, salinity, turbidity and fluorescence along with meteorological information is also collected. Access the archived mooring data directly. Comprehensive, long-term monitoring is a fundamental element of resource management and protection. Monterey Bay National Marine Sanctuary's Research Program monitors ecosystem resources through SIMoN, the Sanctuary Integrated Monitoring Network. SIMoN, now expanded to Greater Farallones and Cordell Bank national marine sanctuaries, is an integrated, long-term program that takes an ecosystem approach to identify and understand changes in each sanctuary. It provides resource managers with the information needed for effective decision-making and integrates ongoing efforts at the over 30 regional marine research institutions. The West Coast Region seeks to support research into human connections to the sea that include indigenous native cultures, seafaring traditions and the discovery and protection of maritime heritage resources. Today, indigenous people continue their seafaring cultural activities that include building traditional watercraft and traversing sanctuary waters. Maritime heritage resources such as shipwrecks, and those objects which remain in place to remind us of historic activities such as lighthouses, historic wharves, docks and piers, populate the coastline from the State of Washington to California. Please visit the West Coast Region's maritime heritage webpage for more information. In addition to fixed moorings, the sanctuary program's sister vessels R/V Fulmar and R/V Shearwater, collect and transmit oceanographic and meteorological data in near real time. See an interactive map of the latest vessel locations and recent data reports. The information from these platforms is archived in an IOOS compatible format and is fed into the NOAA-wide PaCOOS project which will help decision makers with resource management authority, including the sanctuary program, in the California Current Large Marine Ecosystem.